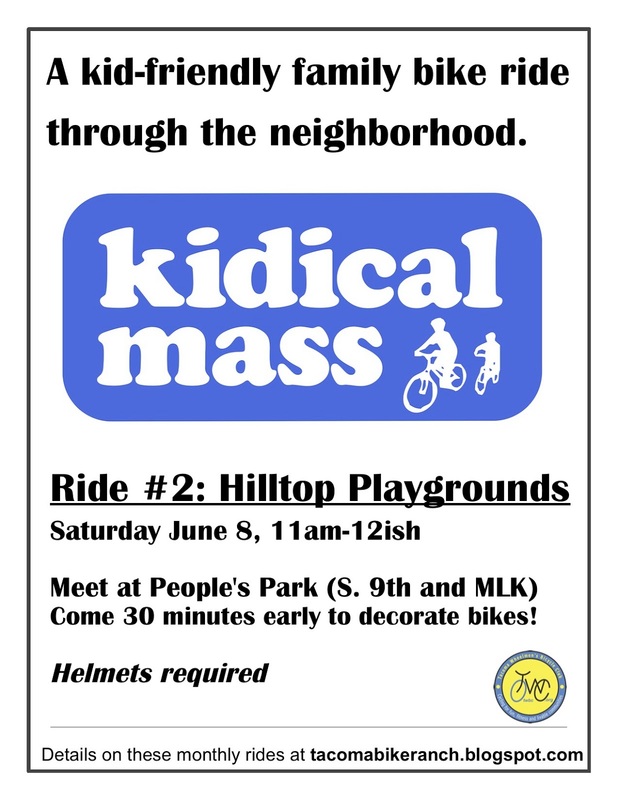 We had a great time on our last ride, so here are the details for our upcoming Kidical Mass Tacoma ride! Meet at People's Park (South 9th and Martin Luther King Jr Way) between 10:30-11am on Saturday, June 8. We will roll out at 11am on our way to McCarver Elementary and Zina Linnik Park, a 1.8 mile route. Helmets are required for all riders! Helmets are a good idea and, in Tacoma, it is the law that you wear one while riding a bike. We have some cool swag from the City of Tacoma the Tacoma Wheelmen's Bicycle Club for the kids (bike bells, slap bracelets, sunscreen) and some craft supplies to help you decorate your bike. Show up a bit early to take advantage of that! On our way, volunteers will help us block traffic and cross arterials safely as a group. The pace will be rather slow (about 5mph) so that a rider on a 16"-wheeled bike can stay with the group. We'll hang out at McCarver for 20 minutes or so before heading back to People's Park for a snack. The return route will be more direct and we'll decide from a few options based on how comfortable riders are with traffic. We should be back at People's Park around noon, so feel free to pack a lunch and have a picnic if the weather is nice. We'll still ride in a drizzle, but extreme rain will cancel. Dress for the weather. Questions? Feedback? Are you planning to attend? Ideas to make this more awesome? Please post comments! Are children riding in a trailer required to wear helmets? My wife and I want to go but the twins will be sleeping in the trailer if we do. Technically, yes. Chapter 11.30 of the Tacoma Municipal Code for those who want details. Admittedly, I've carried my own children in a trailer without helmets when they were smaller. Between about 9-12months old, I would strap T in her carrier carseat and buckle that into the trailer, using the carseat handle as an extra roll-cage. It was great for super low speed errands and nap rides. I'm thrilled that this one is meeting in Hilltop. There are scads of families that bike out here.